Laura graduated from the University of Calgary in June 2012 with a BSc in Environmental Science and a concentration in Geology, a program that puts emphasis on hydrogeology and aqueous geochemistry. During the summers as a student, Laura worked with Devon, an oil and gas company in Calgary, Alberta, with their Environment Health & Safety group. After completion of her BSc, Laura obtained a position as a Junior Hydrogeologist with Amec Foster Wheeler. She spent nearly four years with Amec Foster Wheeler working on a variety of projects including large scale aquifer characterization, contaminated site management, groundwater monitoring programs, water diversion licencing and reporting and Environmental Impact Assessments. It was in her position at Amec Foster Wheeler where Laura's interest in geochemistry peaked. She began her MSc under the supervision of Dr. Dirk Kirste as part of the Hydrogeochemistry Research Group in the Earth Science Department at Simon Fraser University in January, 2016. 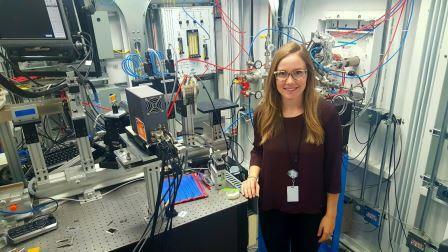 She is currently gaining invaluable experience with experimental geochemistry and synchrotron radiation techniques and is excited to be conducting research related to the mining industry. Negative impacts of selenium contamination have been widely documented in literature and are largely attributed to industrial practices, such as mining. Bacterially-mediated redox processes are currently used in the mining industry to treat selenium-rich wastewater and prevent the migration of selenium into surrounding ecosystems. The by-product of this treatment is a solid state residual which contains the selenium. My research focuses on understanding how the selenium is contained within the residual, and under what conditions it may remobilize. This research aims to characterize the residual using X-ray Absorption Near Edge Structure (XANES) techniques and to determine the mobility controls through a series of aqueous experiments that represent different redox and pH conditions. It is expected that the majority of selenium in the residual is either bound to organic matter, adsorbed to metal-oxides or in its elemental form, all of which are vulnerable to remobilization from changes in redox conditions and pH. Once the speciation and mobilization mechanisms are known, proper disposal methods can be developed to minimize the risk posed by the residual. The increased understanding of selenium behavior can also aid in the development of further remediation technologies for selenium and provide scientists with the necessary information to properly manage selenium contaminated sites.